TSWREIS 4616 Teaching and Non Teaching Posts sanctioned in TSWR Schools and Degree colleges. 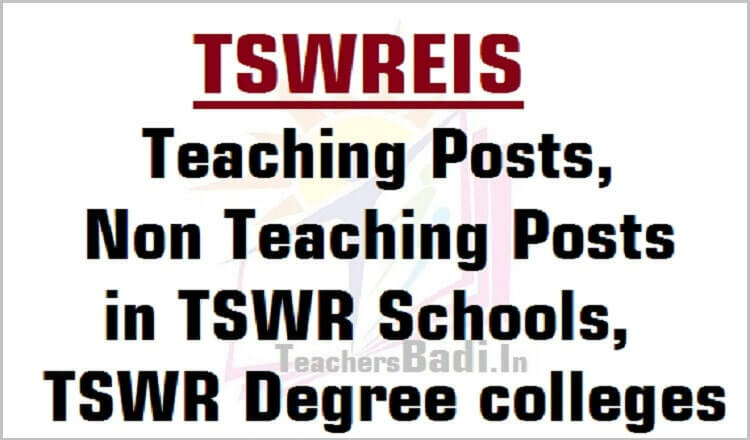 T Government has sanctioned 4616 teaching and non teaching posts on regular basis in the newly sanctioned 103 TSWR Schools and 30 TSW Residential Degree Colleges to be established and run by Telangana Social Welfare Residential Educational Institutions Society (TSWREIS). G.O.Ms.No.79 Dated:22.06.2016:: Govt of Telangana, S.C.Development Department -Sanction of Teaching and Non-teaching Posts in the newly sanctioned (103) TSWR Schools for Boys and Girls, (30) Residential Degree Colleges for Girls and in the O/o. the Secretary, TSWREIS, Hyderabad to be run under TSWREI Society-Orders - Issued. ORDER: In the reference 1stread above, Government accorded administrative sanction for opening of new 103 TSWR Schools for Boys and Girls and 30 TSWR Degree Colleges for Girls from the Academic Year 2016-17 in Telangana State. Principal, Degree College Lecturer, Librarian, Physical Director, Superintendent, Health Supervisor, Senior Assistant, Lab Assistants,Computer Lab, Assistant, Assistant Librarian, Store keeper, Additional Secretary, Deputy Secretary, Executive Engineer, Assistant Secretary, Assistant Secretary (Audit), Superintendent, JACT posts in 30 Degree Colleges and O/o Secretary, TSWREIS (Head Office). The S.C. Development Department shall obtain concurrence of Finance (HRM.II) Department before initiating measures to fill up the posts sanctioned in this order, wherever service rules prescribe direct recruitment. The S.C. Development Department is requested to take necessary further action in the matter accordingly.